Matthew C. Hunter. 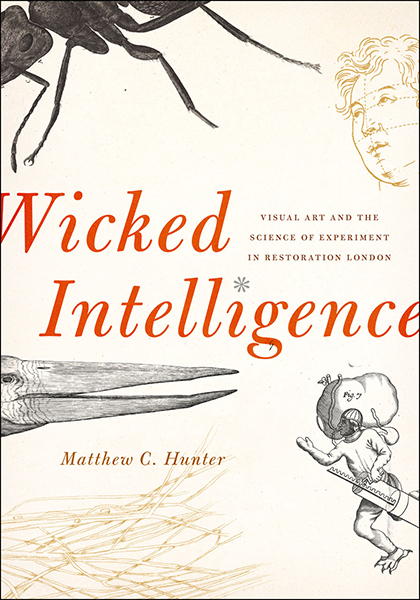 Wicked Intelligence: Visual Art and the Science of Experiment in Restoration London. Chicago: University Of Chicago Press, 2013. 352 pp. Hardcover $55.00. Perhaps the most familiar question posed by early modern art and science is one of mimetic fidelity: how could images, unavoidably mediated by human intention, be made to transparently convey new views of the natural world that were appearing in the lenses of microscopes and telescopes? For Matthew Hunter, though, this is a question that moves us too quickly past the materiality of the image and that too easily equates art with the visual. Hunter focuses our attention instead on the experimental “graphic practices” (70) that networks of scientists and artists in Restoration London developed in order to disclose the mysteries of nature, from urine crystals to porpoises to comets. These practices are to be found both in places you might expect (illustrations in Robert Hooke’s monumental Micrographia and his ill-fated journal Philosophical Collections) and in places you might not (a cut-out paper fish; a paper model of a measurement tool embedded within telescopes; a model of St. Paul’s Cathedral). This peculiar array of objects allows Hunter to mine the seam between visual culture and object culture: scientific images regularly turn out to be scientific objects, and vice versa. Ultimately, a wide range of materials drawn from the archives of the Royal Society are shown to not be illustrations or models, but the residue of actual thought processes: a given image or object (an image, more precisely, as an object) reveals what it was to think through scientific questions because it was itself part of the thought. Hunter pursues this line of reasoning across a series of chronologically-arranged cases, from Micrographia to Peter Lely’s sleepy-eyed portraits to Christopher Wren’s designs for St. Paul’s Cathedral, in which Hooke and the archives of the Royal Society provide the center of gravity. In what sense is this kind of intelligence “wicked”? One answer is this: Hunter’s protagonists engage in heuristic, provisional, and subversive ways of doing science; they attempt to take the natural world by surprise. To study an agitated ant under a microscope, Hooke wickedly realizes, he must first get it drunk. Another answer is this: experimental inquiry often went against the grain of social norms, as when Hooke reverse-engineered Leibniz’s calculating machine, enraging the philosopher. And yet, the ethical and moral resonances of “wicked” sometimes seem too limited for what Hunter in fact shows to be a much wider-ranging sensibility. One wants to say that this kind of intelligence is more broadly of the sort that Michel de Certeau would call “tactical,” in that it attempts to chart its own path through the newly-alienated natural world encountered by seventeenth-century science. But Hunter is well aware that not all of his examples betray wickedness in the usual sense, which is why, in his introduction, he expands his definition. Wickedness is also the wickedness of New England slang: “excessive, flabbergasting awesomeness” (23). That such a phrase makes an appearance is one indication of this book’s lively sensibility. A distinctive pleasure of Hunter’s work is that he so obviously shares with his subjects a commitment to wicked intelligence, coming at received scholarly narratives surreptitiously, obliquely, by surprise—much like Hooke with his ant. This sensibility is highly productive when it comes to Hunter’s treatment of the materiality of his archive: he repeatedly draws attention to the fleeting physical traces that support his claim that actors adapted to the particular affordances of the graphical media through which they pursued their inquiries. Looking at snowflakes drawn by Hooke, for instance, Hunter doesn’t see the snowflakes, but the incised mark of Hooke’s compass and straightedge (“imperceptible in photographic reproduction” (50)), which reveals that these images were drafted rather than drawn. In moments such as these, Hunter takes inspiration from a different kind of “ant,” Bruno Latour’s actor-network theorist who traces the distribution of agency across associations of humans and nonhumans. Throughout Hunter’s chapters, image-objects are repeatedly animated as agents in the story of how Restoration art and science at once intersected and competed. The subversive cleverness that characterizes Hunter’s interpretation of his archive extends to his disciplinary engagements as well. At one moment, we are given a plate from Hooke’s Philosophical Collections, which illustrates the issue’s articles with images, diagrams, and even a paper instrument meant to be cut out and reassembled. As Hunter astutely observes, the ontology of this image is remarkably complex, including “depictions of bulbous, calcified curiosities; schematic diagrams of muscular mechanics; a range of cutaway views; and a paper instrument” (142). To account for how a seventeenth-century observer might make sense of this diversity, Hunter calls upon an unlikely source, Alois Riegl’s account of how the viewers of sixteenth-century group portraiture forged connections among the figures in paintings that were not meant to mimetically depict a meeting that took place, but to express some kind of solidarity of purpose among individuals: “No less integrative intent,” Hunter observes, was demanded by the viewer of a plate in Philosophical Collections, who similarly had to “divine unity” among various “visualization strategies” (144). This moment exemplifies Hunter’s commitment to looking well beyond the history of science to make sense of scientific images. Some might find it a touch too wicked, wanting a slower elaboration of the analogy between portraiture and illustrative plates, but it is precisely Hunter’s willingness to make risky moves like this that renders his approach conceptually generative. For historians of early modern art and science, Wicked Intelligence will unfold a new vision of how these fields intersect: not so much through scientific illustrations and painting, but through much wider array of practices that extended cognition into physical surroundings. But its provocation should be felt by a broader audience as well. Hunter models a way of approaching the historical relationships of aesthetic practice and natural philosophy by attending to visual objects as active participants in intellectual inquiry—not only for those who made them, but also for those who continue to encounter them in archives today.